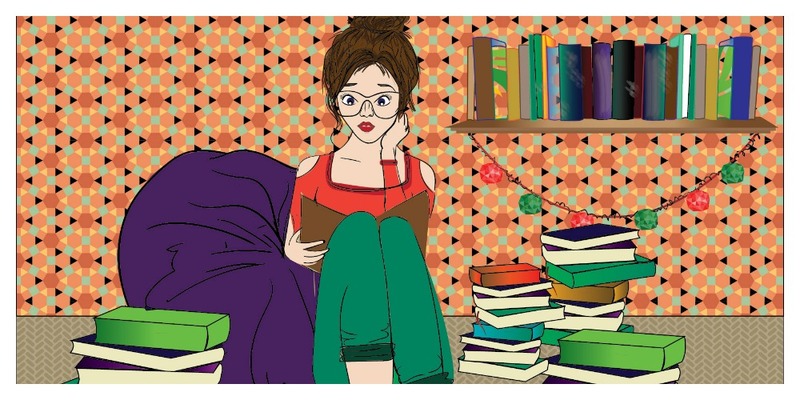 Much ado about Nothing: On not being able to read as much. On not being able to read as much. This year, as I celebrated the end of another year gone by, my heart felt a little heavy. Heavy, at the thought that I didn't even make it halfway through my reading challenge on goodreads. The challenge number on goodreads is more than just a number in my life, its an obsession. Its what guides my reading choices, and pushes me forward. All that talk about not putting so much pressure on reading? Well, it applies everywhere, except this particular aspect. So why was the number so low? I have no particular reason. I have excuses, and they are no different than anyone else's pre-occupations in life. I am not especially entitled with a busy life. I am entitled with specially bad time management skills though. I have been distracted, wasted my time and put reading on the back of my mind. I bought and bought books without carving out any time to read them. Why do I write this self-deprecating post you may ask? Because, this year I plan on changing that. I plan on using my phone less, and reading more. I plan on trying new genres, taking more recommendations and having patience to see the end of books through. I plan on reading in whatever time i find, rather than waiting for 3 hours to magically fall in my lap. I plan on doing better on something that is of incredible significance to me. And, I write this here to hold myself accountable. And to the two people who might read this post, if you did not read as much this year, and it makes you feel some kind of way, its never too late to get back to it. Happy new year! May all the books you read this year make it to your favorite list, and confuse the hell out of you when you try and choose.